1. How has climate change affected weather patterns in SA? The weather patterns are more unpredictable and extreme, for example there are prolonged dry seasons, then flooding. We also experience wild swings from day to day – in Cape Town we had hot humid conditions and lightning in October followed by weeks of unusually cool weather, followed by a 40 C heat wave. And snow in mid November! The winters are becoming milder, which is an issue because fruit trees need a period of dormancy (rest) in order to produce well. 2. How can we respond to changing weather patterns in the way we manage our gardens? We can respond by creating resilient landscapes and gardens that can adapt to changing weather patterns and bounce back after extreme events. The drought has been a real eye opener in this regard: many people realised they had been overwatering their gardens, and that most established plants could survive and bounce back after the first rain. Plants that require a lot of regular watering and feeding are obviously not suited to your garden conditions. Choose hardy resilient plants instead that thrive with least human input in your garden. Please note that resilient doesn�t mean only succulents! There are hundreds of resilient shrubs and groundcovers that can survive with local rainfall. Instead of working against nature allow natural ecological processes to take place. For example open areas will be colonised by pioneer species; fallen leaves and branches will decay on the ground, thereby mulching the soil and releasing nutrients through the natural process of decomposition. 3. How do we build resilient landscapes? � Create structure in the design: �good bones’ using hardscape elements and hardy long-lived evergreens. � Create flexibility in the design and relax control: allow plants to migrate and �find� their own place in the landscape – these will be the areas (habitats) most suited to them. � Create a closed system for your garden with no outputs (garden refuse) or inputs (fertiliser, compost, water, plants) – allow natural cycles to take place instead. � Select plants not on aesthetics or emotional attachment – opt for plants that can survive drought, tolerate a wide range of conditions and rapid recovery after a major disturbance. When resilience is the main criterion, weedy and self-seeded plants are not a problem but an asset: they contribute to the long-term sustainability of the landscape. � An adaptive response to changing weather patterns requires changes in the way we see and what we do. Perhaps the biggest challenge is that we have to undo old habits (overfeeding, overwatering) and do less. No more digging (which upsets soil microorganisms and disturbs roots), no feeding, no raking of leaves, no spraying for pests – it requires a much lighter touch and an attunement to natural processes. One can learn a lot by observing plant communities growing on un-irrigated road verges and natural areas – these are usually resilient and self-sustaining. 1. Set yourself the challenge: zero storm water runoff from your property. Capture and store rainwater from roofs and air conditioners and ensure that all water runoff from paved areas goes directly into the soil. Avoid hard surfaces and choose permeable options instead (e.g. planted and mulched areas). If you need a hard durable surface consider materials such as stone chip or peach pips – these can be stabilised with a plastic honeycomb like product called Gravelfix, or permeable paving. 2. Consider your garden like a giant underground reservoir or sponge, and do whatever you can to maximise the infiltration of water. Find out about rainwater harvesting and how to �plant the rain�. For more detail visit Brad Lancaster�s website https://www.harvestingrainwater.com. Ensure you have carefully planned overflow systems to handle downpours and prevent flooding. 3. Zone your garden into water-use zones, with a small high water-use area close to the house (e.g. pots or plantings seen from living area) and a large area allocated to a low or no water-use zone, using plants that can survive on natural rainfall. 5. Use trees and large shrubs for creating shade, screening and privacy. Instead of building boundary walls, plant mixed hedges of indigenous plants – you will enjoy masses of greenery, foliage textures and flowers and create wonderful habitat for birds, bees and other wildlife. 6. Measure, monitor and manage your water-use carefully. If you have a borehole, it is now a legal requirement to install a water meter so that you can monitor water usage and detect leaks when they arise. Smart meters offer the convenience of real-time data on a handheld device in your home. 7. When watering water deeply and infrequently. Mimic a good rainfall event of say 50mm and really saturate an area, with water penetrating at least 50-60cm into the soil. Then you may only need to do this every 3 to 4 weeks. 5. How can resilient landscaping save you money? � By �planting the rain� instead of letting it run off your property, and choosing appropriate plants, you can enjoy a lush garden teaming with life with minimal input. It really is the smart choice! � Strategically planted trees offer shade and coolness – saving you the capital investment and running cost of air-conditioning. � Wicking beds are a water-efficient way to grow veggies and provide ongoing access to fresh salad leaves, spinach, herbs and tomatoes, to name just a few of the easiest ones to grow. Resilient gardens and landscapes make a valuable contribution to the urban ecosystem, making our cities livable, sustainable and a pleasure to be in. 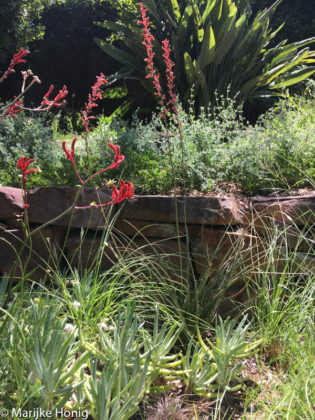 A resilient plant combination of red Kangaroo Paw (Anizoganthos), Cotyledon orbiculata, Eragrostis curvula and coral Hesperaloe parviflora in front, with the lacey grey foliage of Rhagoda histata (Saltbush) and Strelitzia reginae behind. Self-seeded plants like Geranium incanum are an asset in resilient landscapes, filling in any gaps.